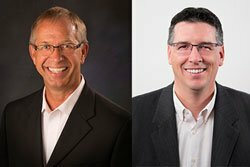 Congratulations are in order for Stan Krempges and Tim Bartholomew who combined forces to launch their own business; The Growth Coach of Springfield Missouri. Tim Bartholomew attended college at Pittsburg State University and immersed himself in the art of building houses. Once the economy crashed, Tim moved into commercial construction where he bounced around in various management and leadership positions for the next decade. Stan Krempges was familiar with business ownership; having owned his own business for 20 years and franchising the company to 22 locations! Stan decided to sell his business but chose to stay on and serve as vice president, helping to continue the expansion from 22 to 34 locations. “I met Tim in 2017 and we’ve been in touch ever since. As we’ve been talking about our strengths and our weaknesses in our own, individual businesses, we realized that we could combine our efforts and grow this business together. Our skills are complementary, and it makes perfect sense to work together,” Stan Krempges said. The Growth Coach is the largest provider of affordable group coaching workshops in the nation. Our Growth Coach Franchise Owners offer group and one-on-one coaching for sales professionals, managers, management teams, self-employed professionals and more with a wide variety of programs through three industry-leading series – their Foundational Series, Fundamental Series and Fast Forward Series. Stan and Tim are both certified in The Strategic Mindset coaching process, which follows the standards, practices and policies that the International Coaching Federation has set forth in their Code of Professional Standards and Ethics. The Growth Coach’s mission is to help business leaders build more successful businesses and more balanced lives through coaching, support and accountability. The Growth Coach of Springfield, Missouri has been serving Springfield, Nixa, Ozark, Branson, Republic and the surrounding area since the franchise opened back in August of 2017. To reach Stan Krempges, call (417) 343-0200 or email SKrempges@TheGrowthCoach.com. To reach Tim Bartholomew, call (417) 880-5456 or email TBartholomew@TheGrowthCoach.com. For more information about The Growth Coach of Springfield MO, visit http://www.TheGrowthCoachSpringfieldMO.com.